We are proud to be among Orange County's best spa experience for clients seeking personalized skin care and massage treatments for relaxation or, stress management at affordable prices. Tucked in the beautiful City of Rancho Santa Margarita (near Coto de Caza, Mission Viejo, Portola Hills and Trabuco Canyon), our many loyal customers travel long distances to enjoy the exceptional service usually associated with high-end and higher priced spas. We credit this to our team, who come to us with...More a passion for their craft and a work ethic to consistently and thoughtfully going above and beyond to ensure each client's visit was worthwhile. Although our brand is well known for massage treatments, our RSM estheticians are a big part of success. Teens and adults are able to receive a wide range of complex and customized skin care treatments. Their attentiveness to detail and educating each client, are among the top reasons we have earned a loyal following. But, don't take our word for it - come experience for yourself. We promise to make your visit worthwhile and remarkable. 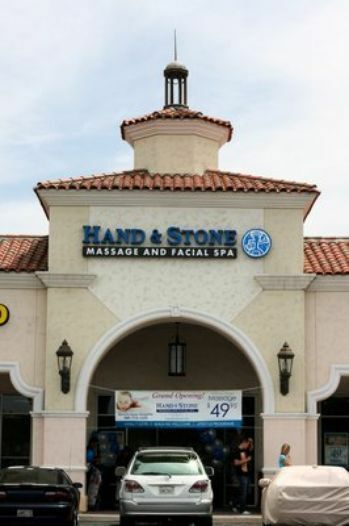 Established in 2004, Hand and Stone Massage and Facial Spa was founded by physical therapist John Marco, who noticed that there was no national massage brand in spite of the service's popularity. Franchising of the concept began in 2006, offering massage, facial and waxing services, along with a membership program. Gus and Bernadette Reid are longtime residents of Orange County and in May 2013, opened their first Hand & Stone Massage and Facial Spa in Rancho Santa Margarita. They are happy to fulfill their lifelong ambition of providing health and wellness services. Bernadette is a Registered Nurse who has a Bachelor's in Nursing and a Masters in Business Administration. She is also a member of the American Holistic Nurses Association and plans to complete her certification in Massage Therapy and Clinical Aromatherapy by the end of 2014. Gus Reid has over 20 years of technology sales, management and marketing experience with a long history of successful relationship development. He is a US Green Building Council LEED Accredited Professional and has recently completed a Certification in Gerontology to support his passion in assisting our aging population. Humbled by the pleasant response from the community, they are happily continuing their passion by providing an unmatched spa experience.